In India, semi-urban and rural areas that contribute to a majority of the landscape, are often impacted by the lack of power and non-availability of ATM fit notes. Since normal ATMs consume high power, require air-conditioners and ATM fit currencies, banks find it difficult to deploy ATMs in such places. 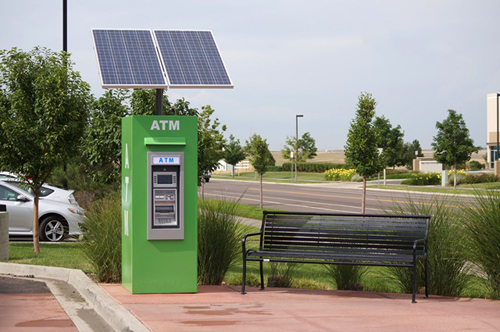 In order to address this problem, Vortex developed a solar ATM that not only consumes less power, but is also operational without air-conditioners. Moreover, it takes care of soiled teller grade notes as well. According to the CEO of Vortex, Vijay Babu, more and more banks are now coming forward to deploy these ATMs. In the initial stage, at least 400 solar ATMs called gramatellers, were installed in 17 states of the country. The State Bank of India, owing to its exemplary performance and substantial energy savings, played a pioneering role in promoting it. IndusInd Bank was the first private bank in India to launch the solar-powered ATM at their Opera House branch in Mumbai. While the Catholic Syrian Bank has placed an order for 50 gramatellers, Bank of Maharashtra and City Union Bank are adopting solar ATMs too. From 2010 to 2013, the number of such ATMs has increased to 100 and now, they are present in different parts of the country. Vortex, which is looking to venture into Asia, is likely to install 5,000 solar ATMs in India by 2015. Elaborating on the measures that need to be taken to reduce the cost of deploying ATM machines, Babu adds that there is a need for technological advancements to address such issues. In order to function smoothly, all that the gramateller requires is merely five hours of good sunshine per day, as it uses solar panels to convert sun rays into electrical energy. During the day, the facility uses solar power and in the same time, spare batteries are also charged. These batteries provide power to the ATM in the absence of sunlight, while the extra power generated during the day is exported to an internal grid for other uses. 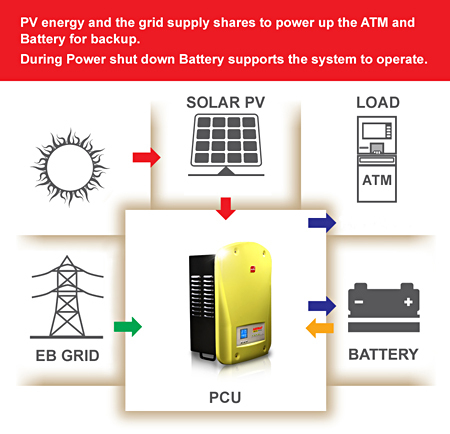 It is the solar inverter and charge controller which manages the switch between solar, battery and grid power. The complete functioning of the system is monitored from a distant area. A single gramateller unit saves over ninety per cent of the annual expenditure of maintaining a traditional ATM, half of whose annual bill of ` 1,44,000 (US$2,530) goes in air-conditioning, electricity and generator running prices. The ATMs survive power fluctuations too since there is a built-in battery back-up for four hours. They can also function in temperatures ranging from 0 to 50 degree centigrade and without air-conditioning. According to reports, the government is now planning to start a mini-banking facility in each of India’s 600,000 villages, with an aim of opening about 25 million savings accounts in villages. Meanwhile, Washington-based World Bank’s International Finance Corporation (IFC) has predicted that by 2015, the ATM market in India is expected to grow three-fold.